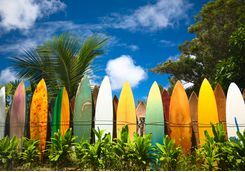 Hawaii conjures up images of idyllic beaches, and world class surf. 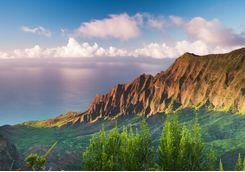 Whilst it offers both of those in spades, that is merely scratching the surface, and this two week island hopping itinerary intends to uncover the many geological faces of Hawaii, whilst staying in the islands' top hotels. This sort of trip would make for a seriously fun luxury Hawaiian honeymoon. Depart from the UK to head towards the tropical islands. 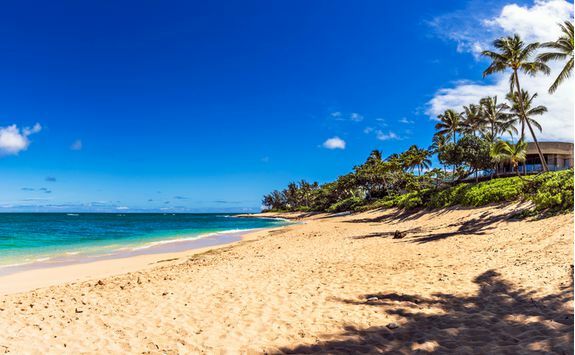 In the interests of full disclosure it's important to know that Hawaii is a long, long (like 21 hours of journey time long) way away but despite that, we still think this is a destination well worth exploring. Read on to find out why. 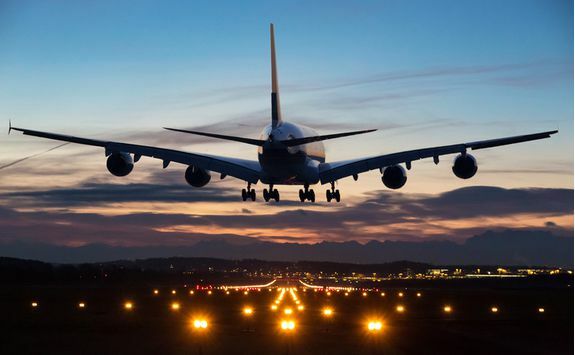 Your day starts with a morning flight to Los Angeles, which is usually an 11 and a quarter hour flight. This being a luxurious trip, we'd probably recommend you fly club class which can make the journey a thoroughly pleasurable experience. 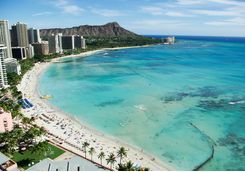 After a couple of hours to stretch your legs at LAX it's time for the six-hour onward flight to Honolulu on the island of Oahu. 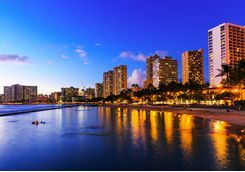 You'll arrive at eight o'clock at night where you'll be whisked to your first luxurious hotel, the Modern Honolulu on Waikiki Beach, by private transfer; a journey of about 45 minutes. Chances are you'll be pretty pooped by now but we always recommend trying to adjust to local time as quickly as possible, so it's a chance to enjoy a light supper at Morimoto, the hotel's high class Japanese restaurant before a well-earned kip. 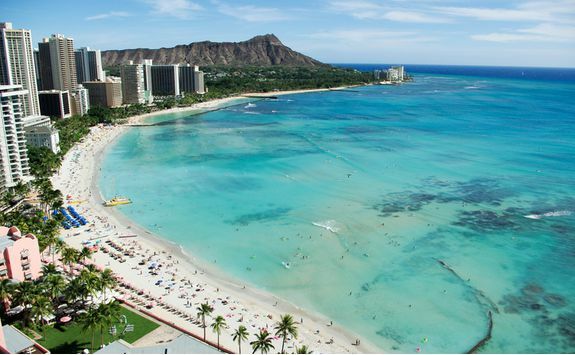 Oahu is perhaps the most Americanised of all the Hawaiian Islands and also home to a place that's a longstanding scar on the American psyche - Pearl Harbour. 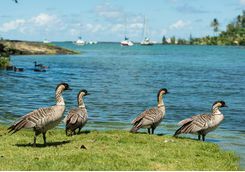 This morning body clock will probably still be closer to London time than Hawaii, which will work in your favour because you'll be up with the lark for a full day tour of Pear Harbour, Honolulu and the wider island with an expert local guide. 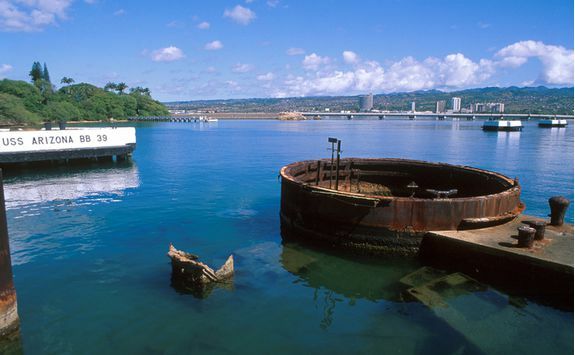 After an early breakfast, your first stop is a sombre one but anyone with even a passing interest in history will appreciate the extraordinary tale of Japan's surprise attack that forced the US in to the Second World War in December 1941. 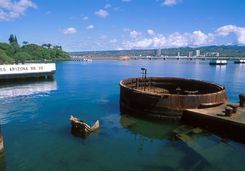 During the tour, which has been specially timed so that you're there at the exact time the attack happened (07:48), your guide will explain the details of the attack and take you round the USS Arizona Memorial, built over the sunken wreck of the bombed-out battleship on which 1,177 US navy sailors died. 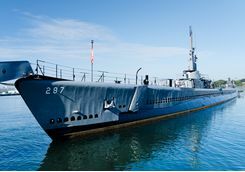 You can also visit the well-preserved WWII era submarine USS Bowfin to see first hand the extraordinarily cramped conditions wartime submariners endured. The final pieces of the military jigsaw puzzle are the USS Missouri, the last battleship ever built (back in 1944 but in extremely good condition) the Pacific Aviation Museum where you can see restored fighter planes and damaged hangars dating from the Pearl Harbour raid. 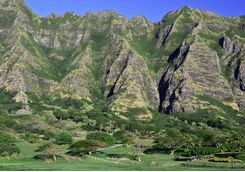 After lunch and a tour of downtown Honolulu you will have the chance to explore Oahu's natural beauty, including the beaches of the North Shore and the rainforest covered slopes of the Ko'olau Mountains which are actually all that remains of the western edge of the caldera of the massive volcano that formed the island. 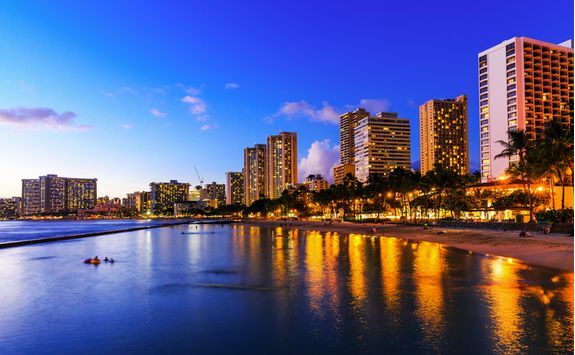 Once you are back at the hotel, it's time to soak up some of Honolulu's famous nightlife with the help of our detailed and discerning Hawaii Dossier, which is regularly updated with all the best places to eat, drink and shop - particularly relevant on Oahu. 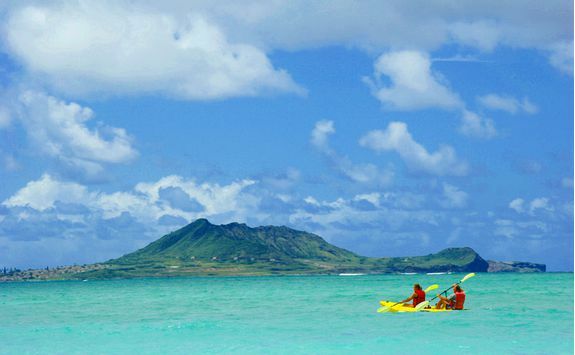 Today you will leave Oahu. 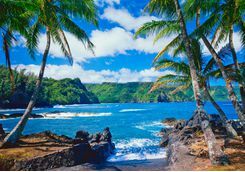 We will arrange for a private transfer to Honolulu Airport for one of the almost hourly 45 minute flights to Kona International Airport on the island of Hawai'i. 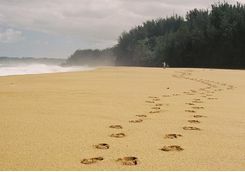 It's a common cause of confusion that the island is known by the name for the entire island chain but you should make like a local and call your home for the next few days Big Island, which does what it says on the tin pretty well as this is indeed the biggest of all the Hawaiian Islands. 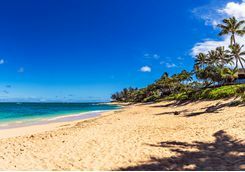 You will be met at the airport for a private transfer to arguably the most luxurious of all the lovely hotels on this trip - the Four Seasons Resort Hualalai, just a quarter of an hour from the airport. 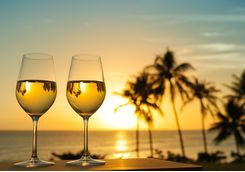 Settle in to the salubrious surroundings of the hotel overlooking the ocean, and perhaps have lunch at the casual Beach Tree restaurant where you can dine al fresco with your bare feet in the sand. After lunch you should explore the resort to understand why this is, apparently, the most successful Four Seasons on the planet, which is saying something. 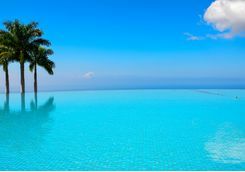 One (well, seven, actually) reasons for that success is/are the hotel pools, which include everything from a conventional lap pool to a slick palm-fringed adults-only infinity pool, an ocean pool where the warm waters of the sea are enclosed by lava rock and finally the cherry on top: the King's Pool. 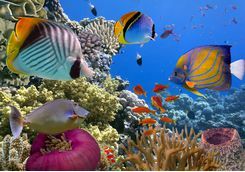 Built into the lava rock and more of an open air aquarium, some 4000 tropical fish (including an eagle ray) call the saltwater rock pool home. 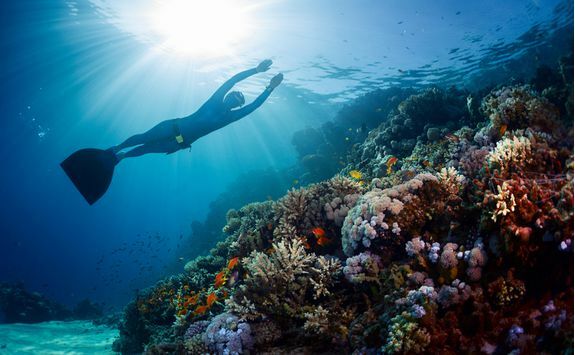 Borrow a mask and snorkel and enjoy one of the most civilised snorkelling trips imaginable. 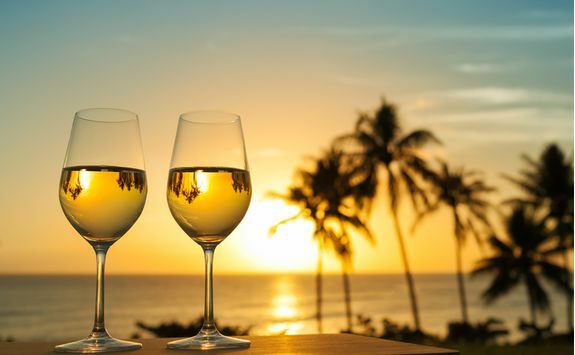 This evening we have booked you one of the hotel’s signature romantic experiences with a private dinner for two on Kumukea Beach. 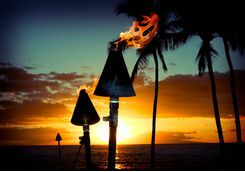 Pre-choose your menu in consultation with the chef and then enjoy a delicious four-course feast with the ocean lapping just a few feet away and tiki torches illuminating the table. 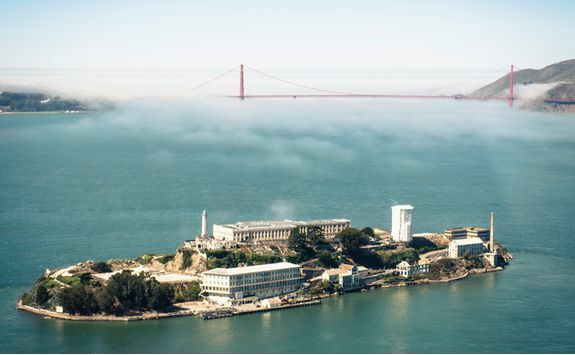 Epic views are on the list for today. 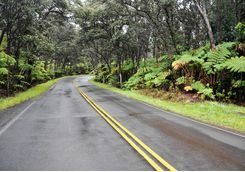 Big Island is best seen from the air, and this morning you will set off for the two hour drive to the airport for your helicopter tour of the island. 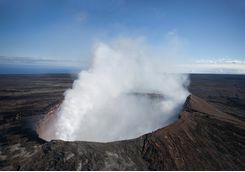 First stop is the immense Kilauea volcano, which has a fine claim to fame for having one of the world's longest eruptions. 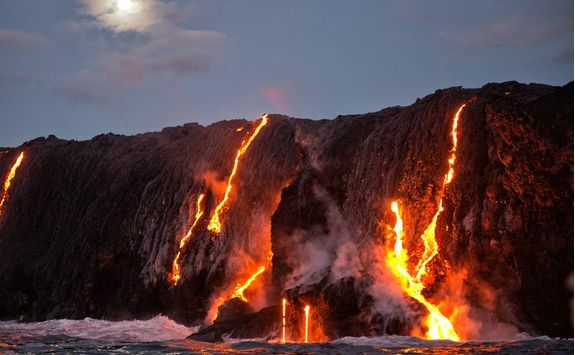 The current one started way back in January 1983 and the subsequent lava has covered nearly 50 square miles of land. 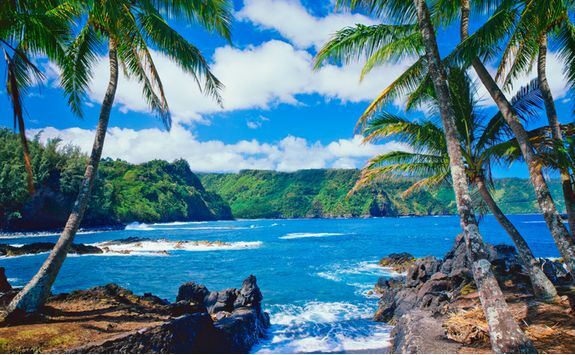 You will see this volcanic wasteland and black sand beaches before soaring above the rainforests, canyons, sea cliffs and waterfalls along the famously beautiful Hamakua Coast. 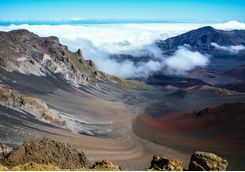 At this point the chopper will set down at the foot of the 1,200ft Punalulu Falls for the ultimate photo opportunity before you head inland to explore the Kohala Mountains where the remnants of ancient settlements can still be seen. Then it's back to the airport after a hugely memorable couple of hours, and a return drive to the hotel to spend the rest of the afternoon relaxing. Tonight there's a chance to enjoy supper at ULU, which specialises in super fresh sushi and other local produce that's oven-roasted, flame-grilled and wok-fired in one of the most romantic settings imaginable. Tonight there’s a chance to enjoy supper at ULU, which specialises in superfresh sushi and other local produce that’s oven-roasted, flame-grilled and wok-fired in one of the most romantic settings imaginable. 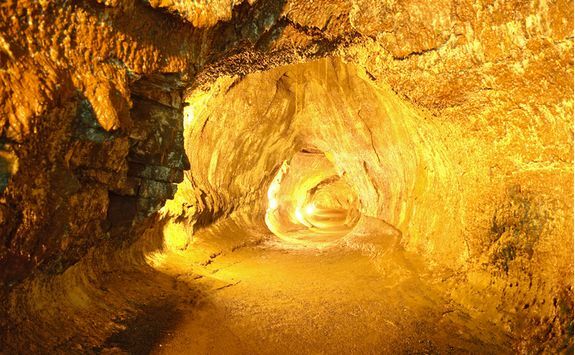 Meander through some of nature's most stunning creations. 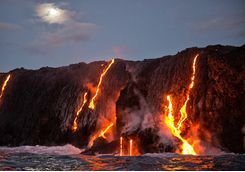 Yesterday was the chance to get a big picture understanding of Big Island but today we've planned a private guided tour to see this geological marvel of an island up close and personal on a tour of Volcanoes National Park. 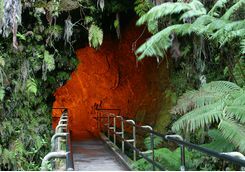 It does mean heading back over to the other side of the island (we can always arrange a helicopter transfer, should the mood take you) but when there you can enjoy a six hour visit to the park, with highlights including standing on the rim of the Kilauea crater for a far better appreciation of the size of the volcano, followed by a visit to the nearby crater lake of Kilauea Iki, which was full of bubbling lava in 1959 and still steams impressively today. 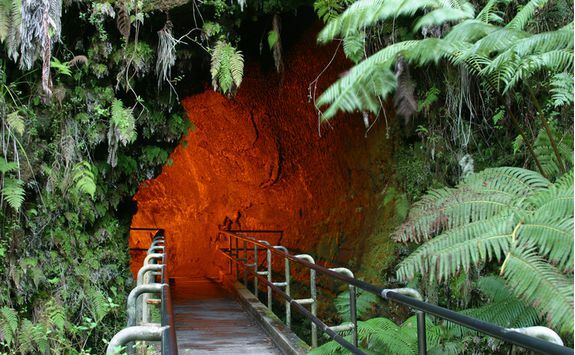 You will then walk through rainforest and into the cavernous Thurston Lava Tube. 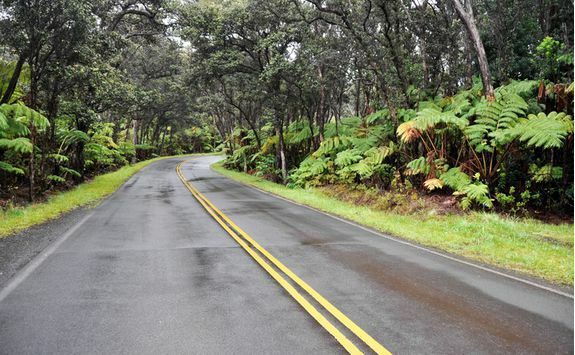 Then it's back in to the vehicle for a drive along Chain of Craters Road, which traces the destructive trail of Kilauea's various lava flows over the years all the way down to the ocean. 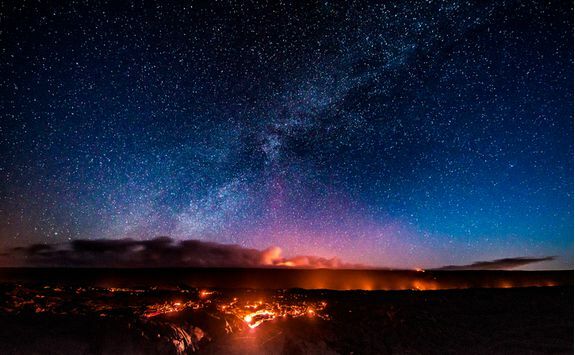 You will then head back to the hotel to enjoy your last night on Big Island. Head to the Hualalai Grille to enjoy sumptuous sizzling steaks and grilled fish and chicken dishes in a restaurant set overlooking the golf course. 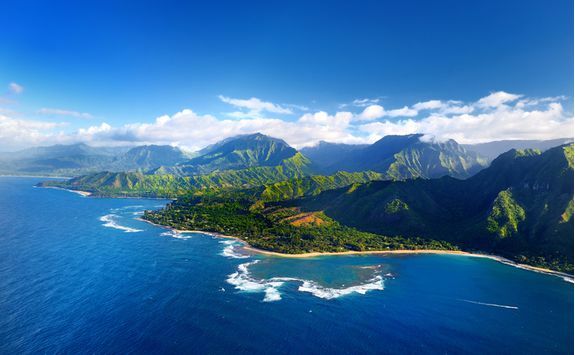 After breakfast at the hotel, you will drop your car off at Kona Airport for the 60 minute flight to Kauai Island. 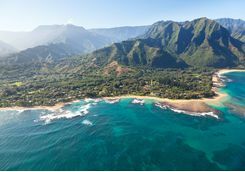 It's then a 45-minute drive in your hire car to the St Regis Princeville. Enjoy a light lunch at the poolside Nalu Kai Grill where you can appreciate the hotel's beachfront setting with precipitous mountain backdrop. 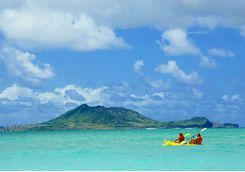 After lunch enjoy a relaxing afternoon on the beach and maybe try your hand at paddle boarding or kayaking. Come evening, make your way to the St Regis Bar for an early evening cocktail before dinner at the Makana Terrace, the hotel's signature restaurant specialising in Hawaiian-inspired cuisine (we'll try to book you in to a table on the outdoor terrace). 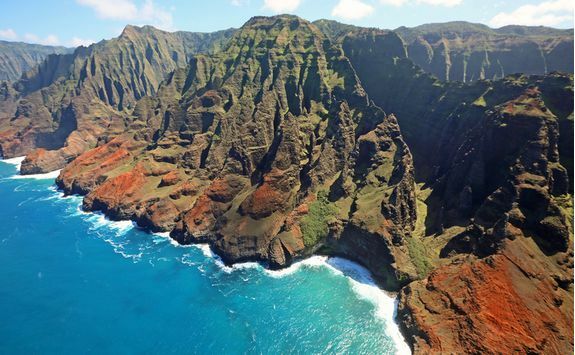 The verdant cliffs of Kauai doubled as Isla Nublar, the famous island theme park in Jurassic Park, and the best way to see the 'Garden Isle', arguably the prettiest of the main Hawaiian islands, is on a helicopter tour. 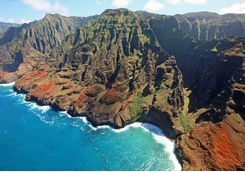 The verdant cliffs of Kauai doubled as Isla Nublar, the famous island theme park in Jurassic Park, and the best way to see the 'Garden Isle', arguably the prettiest of the main Hawaiian islands, is on a helicopter tour. We've booked you on a morning flight to see the dramatic mountain scenery up close, and the journey begins with a fly-by of the huge Hanapepe Valley and Manawaiopuna Falls (which featured in Jurassic Park as well) before the landscape gets - if anything - even more dramatic in Olokele Canyon and then the big one - the so-called Grand Canyon of the Pacific Waimea Canyon with its huge waterfalls. Next stop the beauty of the Na Pali Coast and Bali Hai Cliffs before heading back inland to Mount Waialeale, a(-nother) huge volcano and famously the second wettest place on earth. 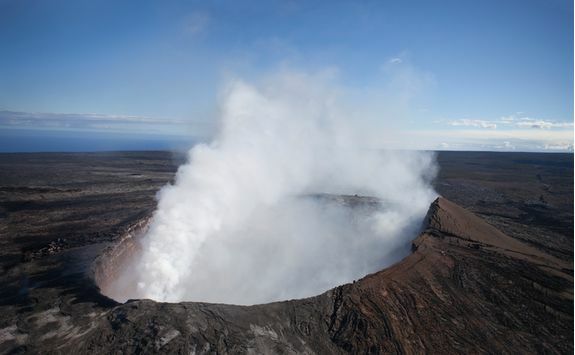 For a final flourish, your pilot will descend for a closer look inside the 5,000ft caldera walls of the crater where waterfalls tumble majestically before you fly back to the airport. 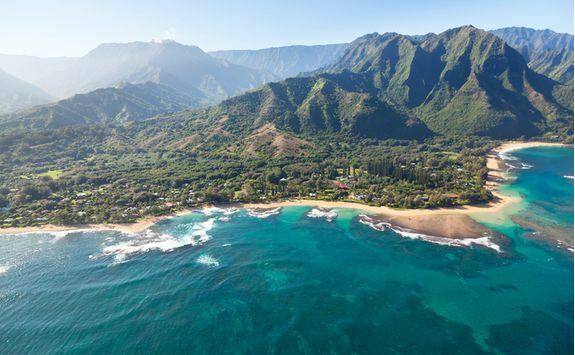 From here it's a short drive back to Hanalei Bay for a private charter cruise of the Na Pali Coast from a different perspective aboard a boat and with the chance to snorkel. Explore this coastline's famous sea cliffs and enjoy the cliffs lit by the afternoon light. 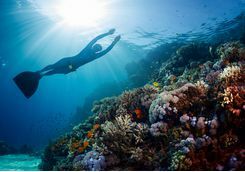 We work with experienced skippers how reckon on a 60% chance of seeing dolphins and a 90% chance of snorkelling with turtles. 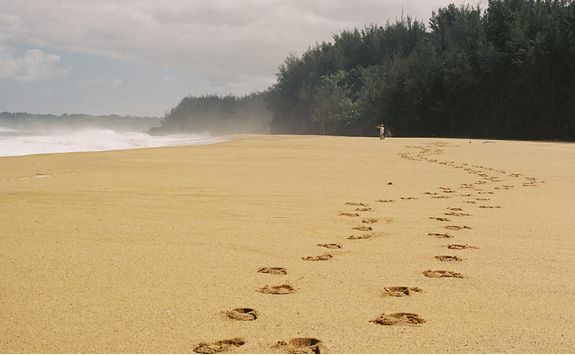 Quite a way to spend your last afternoon and evening on Kauai. Back at the hotel you can enjoy an informal dinner at the Kauai Grill. 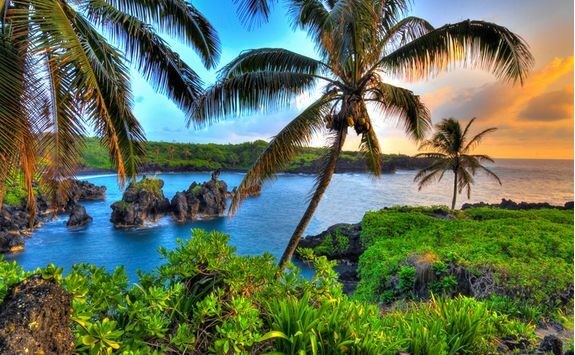 After breakfast you will drive back to the airport for the 35 minute flight to your next island stop - Maui. 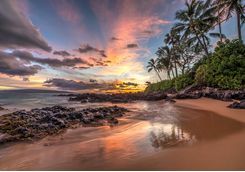 You will pick your next hire car at Kahului Airport and drive to Hotel Wailea, often voted one of the most romantic hotels in the world. 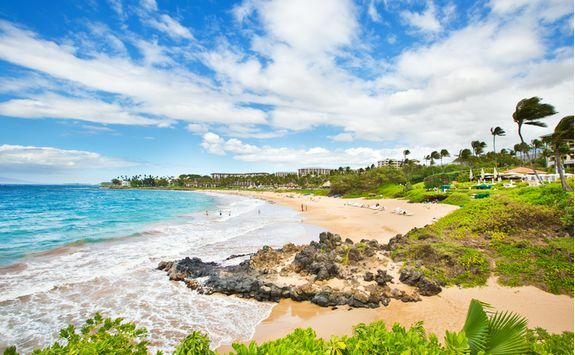 After two shorter stays, we recommend a proper stint here, so you've got four nights and consequently three full days to enjoy everything Maui has to offer. 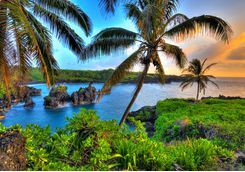 As it happens, Maui is the island best suited for those looking for action-packed activities, but also works wonderfully for a few days pampered R&R. 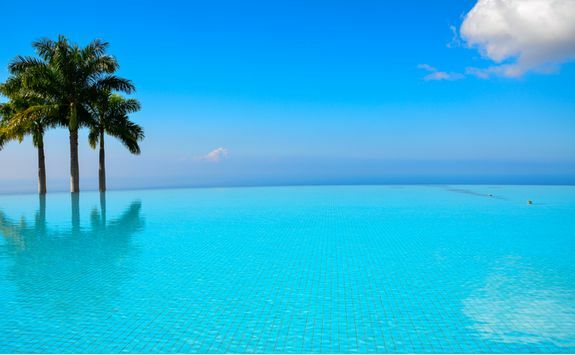 With that in mind, we recommend a lovely light lunch at poolside Cabanas restaurant before spending the afternoon doing as little as possible other than enjoying the hotel's beach valet service at nearby Wailea Beach (note: the hotel is not actually on the beach). Late afternoon we have got something up our sleeves, however, so get yourself ready for a sunset cruise aboard the slick Ali'I Nui catamaran, which leaves from embarks from Ma'alaea Harbour, 25 minutes' drive away. Space is limited to just 30 guests on board and the price includes drinks and canapés to enjoy on deck as the sunsets, with a decent chance to see whales during the season (December to April). Return in time for dinner at the award-winning Restaurant where the chef serves up high quality Mediterranean inspired cuisine using - wherever humanly possible - local Hawaiian produce, including from the hotels' kitchen garden. We will try to reserve you one of the most romantic tables on the terrace overlooking the hotel gardens. We're into the meat of the trip now and this is the chance to mix it up with a combination of activities and R&R. This morning we've booked you on a morning whale-watching trip, departing from Lahanai, which is 45 minutes drive from the hotel. 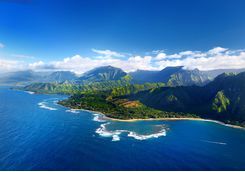 The Auau Channel that separates Maui from the nearby islands of Lanai and Molokai is renowned as being one of the finest places in the world to see humpback whales. From December to April sightings are all but guaranteed as Pacific humpbacks congregate in the shallow protected waters to calve and raise their young. 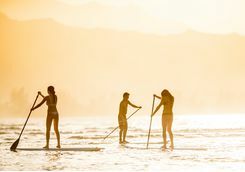 You should be back at the hotel in time for lunch and then we've booked you a private surf lesson on Wailea Beach; after all, to come to Hawaii - the birthplace of the sport - and not try your hand at surfing would be bordering (sorry) on sacrilegious. 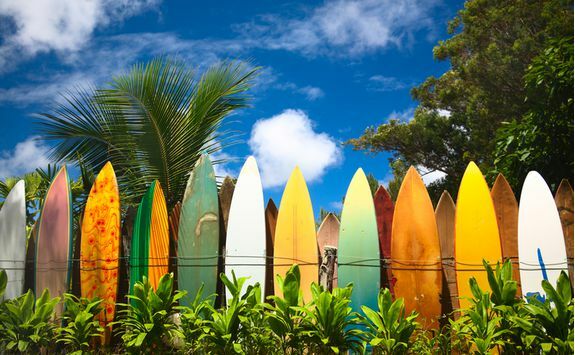 Learn the basics and feel the extraordinary rush when you catch that first wave. You'll pretty likely be hooked for life. 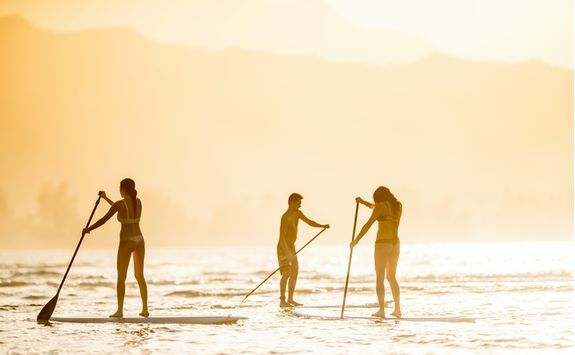 For existing surfers we will arrange a chance to improve your skills with one of the many fine surf instructors on the island. 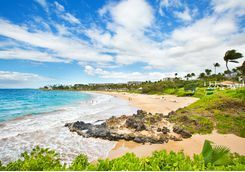 Our Hawaii Dossier will come in to its own today for recommendations of places to enjoy dinner on Wailea Beach, and this could be a good opportunity to pop along to the Four Seasons Resort Maui at Wailea to sample the wares at one their excellent restaurants. 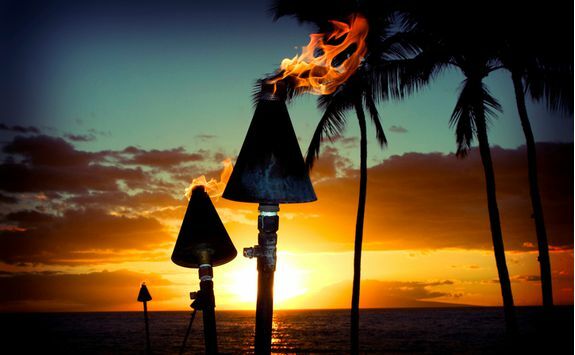 Our Hawaii Dossier will come in to its own today for recommendations of places to enjoy dinner on Wailea Beach, and this could be a good opportunity to pop along to the Four Seasons Resort Maui at Wailea to sample the wares at one their excellent restaurants. An early breakfast today because we've booked you on a catamaran trip to nearby Molokini, a crescent-shaped part of what was once the crater rim of a now extinct volcano. 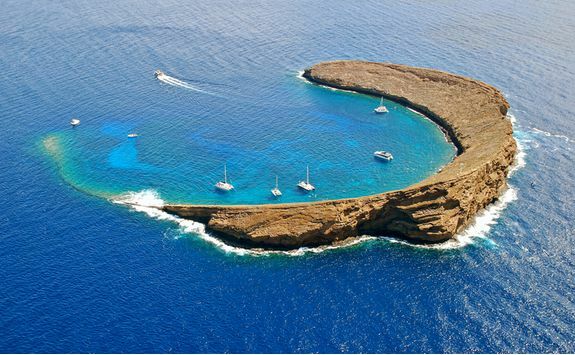 Depart on the catamaran for the fifteen-minute crossing before mooring in the calm protected waters inside the crater rim to snorkel in the designated Molokini Shoal Marine Life Conservation area. 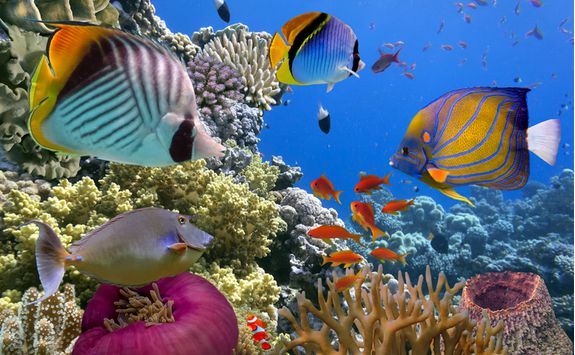 You will be provided with good quality snorkelling gear and the chances are you'll see a wide range of tropical fish from Moorish Idols to Picasso Triggerfish. 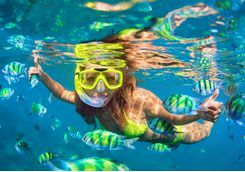 The site can get busy so the catamaran trip also includes an onward trip to Turtle Town, a snorkel site known for its green turtle sightings. After the second snorkel lunch is served and drinks are available from the well stocked bar. On your way back to port you may also see spinner dolphins swimming alongside and throwing in amazing acrobatic displays. 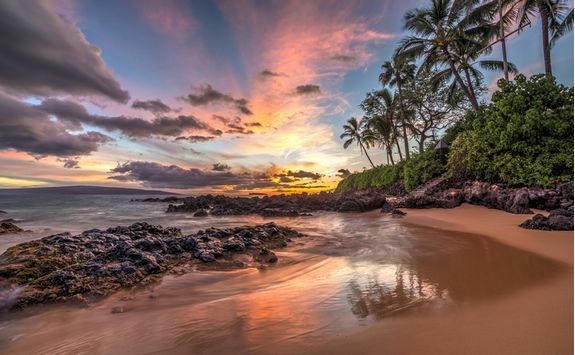 Spend the afternoon relaxing at the hotel and enjoy dinner at a restaurant on Wailea Beach. Disney fans who've seen Moana will know all about the demigod Maui who, legend has it, captured the sun. 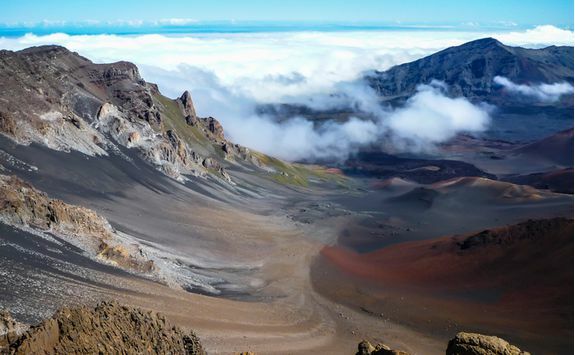 Well the location of this moment of immense impudence is the crater of the vast Haleakala volcano, which constitutes a large part of the entire island. 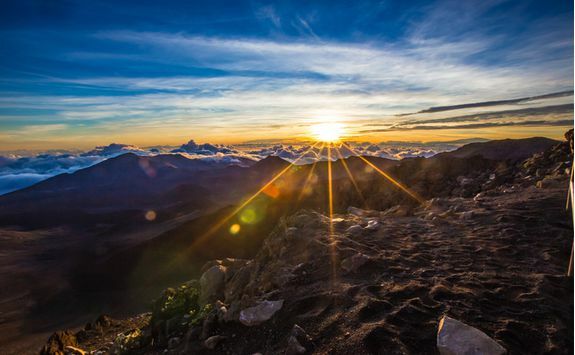 If you're relatively fit, then we'd recommend making a day of exploring the Haleakala National Park. 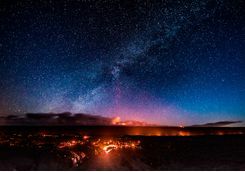 It will mean an early start, setting off at dawn for the one hour 30-minute drive from the hotel to the Haleakala Visitors Centre and subsequent view of the crater and surroundings in the early morning light. 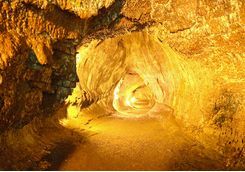 Then the trek begins, and you'll be following the Halemauu Trail for its entire length of 11.2 miles. 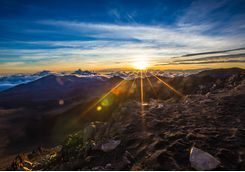 For the record, there are several shorter trails that are also excellent, but this is a superb way to traverse the National Park, and the good news is that in starting from the summit the majority of the walk is downhill and takes roughly six hours. 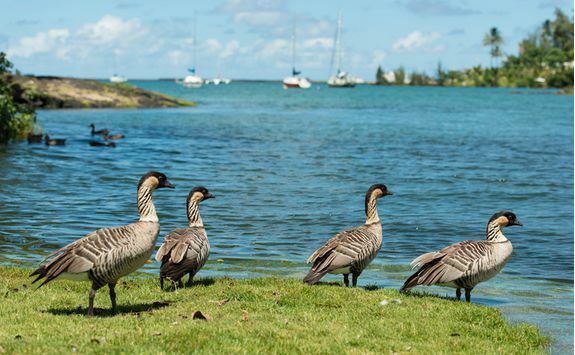 Oh - keep an eye out for Nene geese on route - they're the very rare state bird of Hawaii. From here, you'll drive back to the hotel and a well-earned rest and delicious supper before - we suspect - an early bed. A final morning in beautiful Hawaii before dropping your car back at the airport in time for your early afternoon flight to San Francisco, arriving late evening. You will be transferred to your city centre hotel and we have an excellent selection of properties across styles and sizes to choose from. The journey from the airport will only take half an hour. 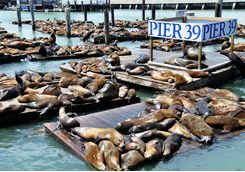 After breakfast at your hotel it's time to explore fabulous Frisco, making sure never to refer to the city as San Fran - a big no-no with the locals. 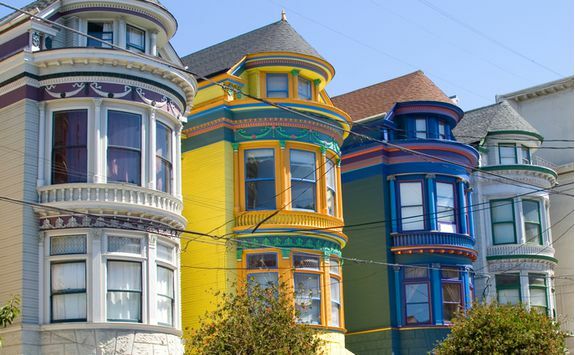 Explore the hippy colony in Haight-Ashbury and the hipster hangout that is reinvigorated The Mission district. 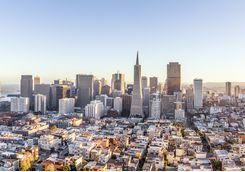 Then swing by Mid-Market to spot geeky gazillionaires who have moved downtown from Silicon Valley. Our detailed Dossier is perfect for plotting a self-guided path around the city or a shopping trip so enjoy this fay at leisure in one of the most civilised cities imaginable. 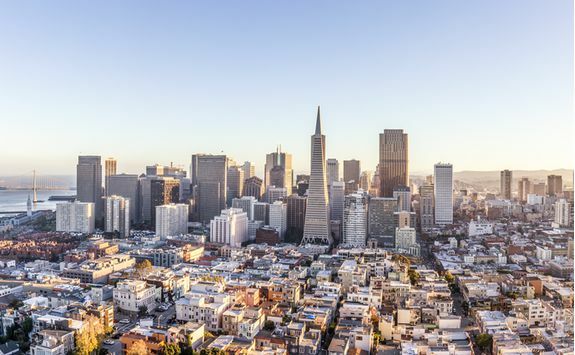 Come evening and our Dossier is on hand again to help you pick the perfect restaurant in a city famed for its unbelievably good Chinese and Japanese cooking thanks to large Asian immigrant populations. 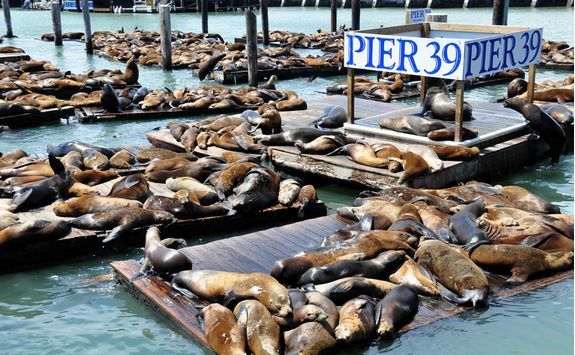 Follow a tour to get the 411 on the hottest spots in Frisco before heading to the airport this evening. 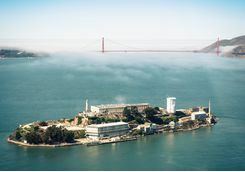 We have arranged for a guided trip to take in the highlights of the city inducing visits to the legendary island prison of Alcatraz, the Golden Gate Bridge, Pier 39 to see the basking sea lions at Pier 39 and if you're a shellfish fan a swing by the Swan Oyster Depot for bountiful bivalves. 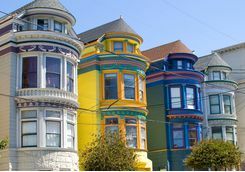 San Francisco can be very touristy, so having a guide for the day means they can plot a path that avoids the crowds wherever possible before delivering you back to your hotel to scoop up your luggage and head to the airport for your evening flight to the UK. 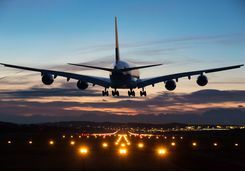 The flight normally takes ten hours and 30 minutes. Your flight will land at around lunchtime in the UK.